The party has officially begun! I cannot express enough how happy Mathew (aka Mister Domestic) and I are for the #EppParty !! 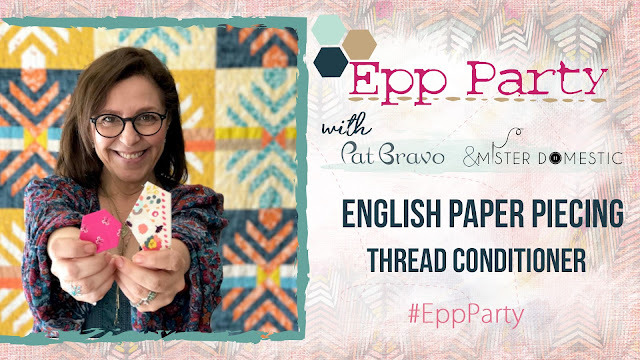 So many of you had been waiting for this event to begin and I am so happy that we can finally start the party and show you the first Epp block! Did we tell you that we are going to glue, piece and sew together 12 blocks for this party? Great, right? Every two weeks you will have 1 new block and at the end we have an amazing surpise waiting for you! If you post your work in progress or finished block within the 2 weeks of the duration of the block with the hashtag #EPPParty, you can win an amazing prize each time. We got you covered! Here you have an awesome picture of the epp kit you can win!! We are offering the choice of printing your own because we want to share with you the entire process from the very beginning, but you know, it's a matter of personal preference. UPDATE: the amazing people from Paper Pieces have made a kit contaning all paper templates to make the first 6 blocks! Isn't this great? So, if you want to go with pre-cuts, here is the link to buy the kit. For the finished quilt you have two options: with or without sashing. 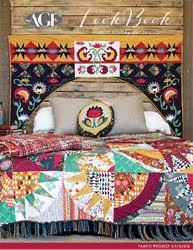 The quilt without sashing will measure around 48" by 48", and then you can make it as big as you want if you add sashing. For the small version 1/2 yard each of 20 fabrics will do very well. I will be doing mine with my newest collection Indie Boheme, but you can use any other fabric you prefer. For this party is all about freedom of choice, a zen experience and all the fun of doing something together! We love scrappy scrappy, don't you? 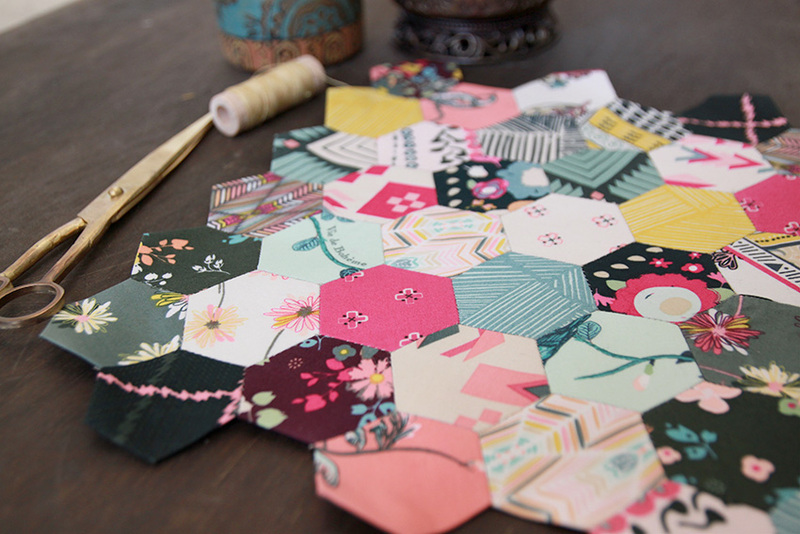 On my WIP sample block, I am using all 20 fabrics because I love the look of tiny hexies made in multitude of fabrics. Very colorful and yummy. This is also a personal choice, you can do it with less fabrics, like picking a group of six or a group of eight fabrics. The steps to construct this block are simple: after you glue all the templates lay them out randomly to piece them later making a square of 12" ( don't worry if it's bigger). 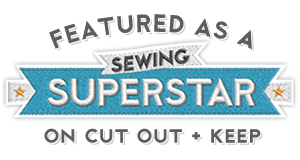 If you really want to learn to sew hexies like a pro, Mathew and I have all the videos you need to watch in order to glue and sew your best hexies ever. Go to his blog to watch them all there or click on the links below. 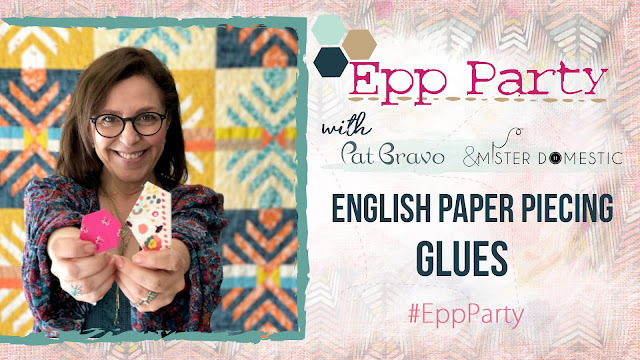 I have so many EPP Tips and Tricks to share with all of you! So, each week I will be explaining more in detail the information about each tip and trick that are shown below or on a separated post. Stay tuned! For week 1, I have some tips on glue choices and thread conditioners. Click on the images below to watch the videos I've prepared for you. Remember! Just by participating, you will have the chance to get awesome gifts from our sponsors! How? Simple, you only need to show your WIP block on Instagram using the #EppParty. The lucky winner will be announced the last day of the 2 weeks! Yea! I can't wait to start. Is that the block pictured? Or are we just supposed to baste the hexies and wait to see the block? I'm doing Indie Boheme also! My bundle should be here tomorrow! Keeping my fingers crossed! hi pat! thank you and mathew for this lovely quiltalong, i can't wait to jump in! a little request, if possible - could you add a size marker to the template ? the little ruler thingy that says 'this is an inch' , so we could be sure to print the right size... my printer always acting out and i'm scared of doing a few blocks and then finding out they don't fit together! Hello. I can't wait to get started! I've been wanting to get into EPP for a while. In your video about thread conditioner, you mentioned a projected you liked for adding grip to your fingers. Could you add a link to the product? Thanks! WOW..............thanks to the both of you for this invite to your EPP Party. Yes!!! It's Epp Party Time! How do I join. I am a newbie to EPP. Hi Pat! I am so excited for the EPP Party. 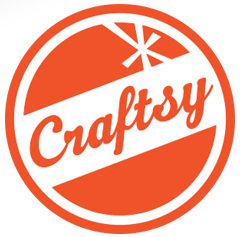 Do you think it would be possible for any of the templates to be available as SVG or image files that could be cut out with a "cutting maching" such as a Cricut? I was able to use a hexagon image I already had and make each side 1 inch creating a 1 inch hexagon and able to quickly cut out the 68 hexagons needed for this project. Jessica, I have added a free SVG file for the hexie madness template to my blog and plan to keep adding new svg files for each new block. Hope this helps! Danica - THANK YOU! I just saw this reply as I was printing out Block 2 Templates and planning to start cutting. I have gone to your site and gotten the SVG file. I really appreciate you making these available! I am a newbie to EPP. I wish it didn't start for a couple of months. Our guild's Quilt Show is later this month and I need to concentrate on getting some stuff done on that. But I only need to show "in progress" right? So I will get a few made and started and when I have some extra time I will work on it and get a photo posted. Thanks to you both! Hi!! In order to participate for a chance to win the prices, you need to add an image of your work in progress in Instagram using the hashtag #EppParty! Good luck! Hi BJ, I apologize, somehow this comment didn't get through or something went wrong. It says that I deleted it but I did not. I was lucky enough to see it also in my email, so I'm answering here. That was your question: Where do I find the pattern and templeate we are supposed to use or is this first week just use a 1" hexagon? If you are interested to know if I provide a pattern for the block, it is shown on the pictures of this post, there is no pattern. The block is made of 68 1" hexies sewn together forming a big square. Or if your question is about if I provide a template for the hexies for the case you are cutting your own, yes I am providing a link on this same post. Click on the link to download a pdf template of the hexagons. Then you can print them and cut them to use. I've been wanting to learn EPP. 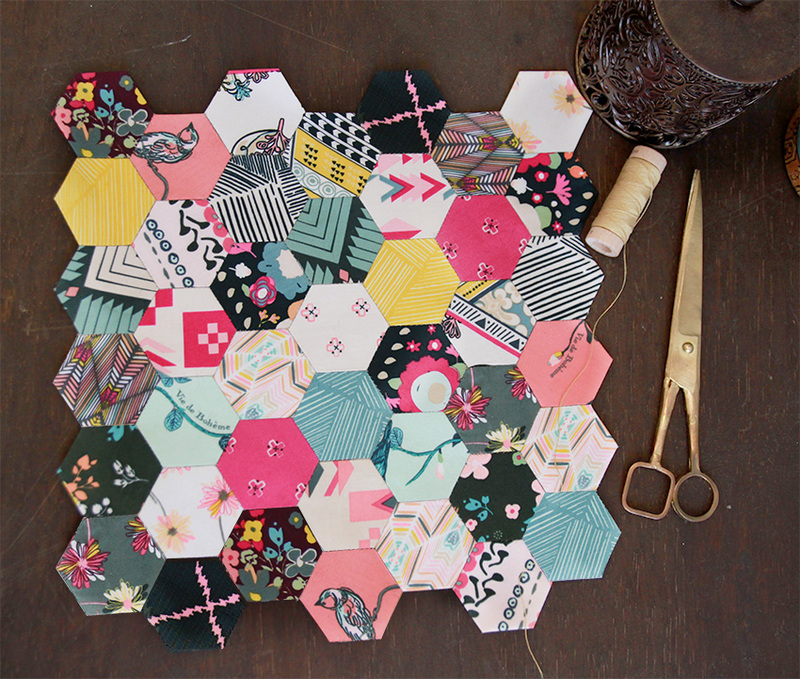 So I have a question for Block 1 are we just supposed to make these hexies and leave them separate or do we sew them all together ..if so in what shape? Sorry I'm confused. Hi dear Cathy! Please don't apologize for being confused and welcome to the party! 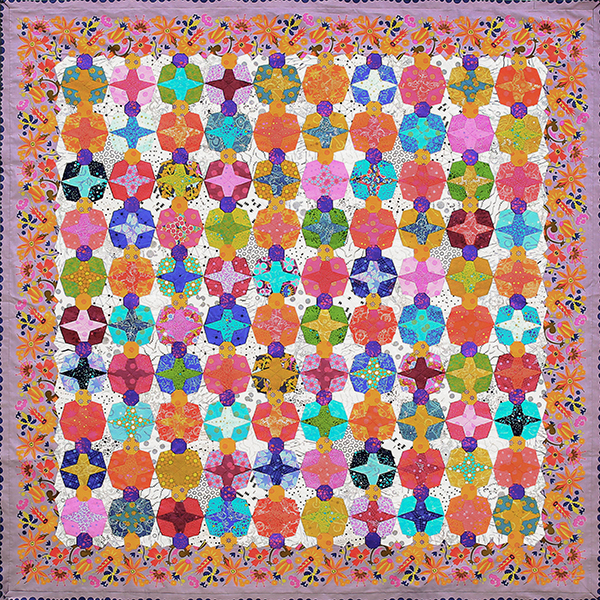 For block 1 we are doing 68 hexies and sew them all together to reach a square block that will be bigger than 12", as I've shown on the picture above from this post. I love this so much! Thanks for putting this all together and for the amazing videos. Seriously, they are so helpful. This is my second EPP project, so I am still a newbie, and this is just so great! I seriously can't say enough to tell you how much I love this! Thank you Danielle!! I'm so happy that these videos are very helpful!! Can I still join the party? How do I join? Hello. I see that I can purchase a paper template pack - is it possible to get the pdf templates ahead of time as well? I would like to start printing and cutting the shapes when I have free moments. Especially those 84 honeycombs! Thanks! Oh my. I am so sorry that I missed the party!!! Shucks! I missed the party too!! Any updates to the winners?? 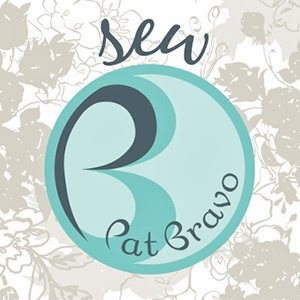 Pat, I am trying the invisible feather stitch. I do not see any stitches on front but, when I hold it up I can see light between the seams. Help. Will this close when papers are removed? Am I maybe taking to big of a stitch ( more than a couple threads)? Any thoughts would be appreciated.